ANNAPOLIS, MD (February 01, 2016) – The gypsy moth was brought to Medford, Massachusetts by amateur naturalist Leopold Trouvelot in the late 1860s. Cotton was in short supply in the aftermath of the Civil War and Trouvelot hoped to use the webbing of the gypsy moth a create a silk-like material. Unfortunately, some of the gypsy moths escaped. Records mention that by 1880 some 400 square miles around Medford were already infested. Within another 10 years, 360 square miles of trees were defoliated, and marauding caterpillars had become a notable public nuisance. Virtually every year since, this scene has repeated itself somewhere in the expanding area of infestation. In Maryland, the first defoliation was recorded in 1980, and outbreaks continue to this day. The gypsy moth is still Maryland’s number one forest pest. For these reasons, the Maryland Invasive Species Council has selected the gypsy moth as Invader of the Month for January, 2016. A new outbreak has started in the Mid-Atlantic Region. In 2014 New Jersey recorded about 10,000 acres of gypsy moth defoliation; in 2015, the state recorded over 100,000 acres.. Pennsylvania recorded over 700,000 acres of gypsy moth defoliation and West Virginia, over 100,000 acres. So far, Maryland has not experienced this new outbreak. In 2015 no gypsy moth suppression project took place and only 303 acres of gypsy moth defoliation were reported. However, there are over 800 acres of proposed gypsy moth suppression area so far for spring 2016. Egg mass surveys are showing increased gypsy moth populations throughout the state. Gypsy moth, Lymantria dispar, has five to six caterpillar size stages. Generally, we notice only the last two or three stages, or instars. These late instars have dark grey segmented bodies with several sparse tufts of stiff hairs. The first five segments have pairs of blue dots; the next six segments, pairs of red ones–on the top side of each segment. This unique pattern allows the late stage caterpillars, which may be 1” to 3.5” long, to be positively identified, differentiated from any of the thousands of other American caterpillars. The large caterpillars, which do the vast majority of feeding, appear in June. At this instar stage, it is too late to spray. 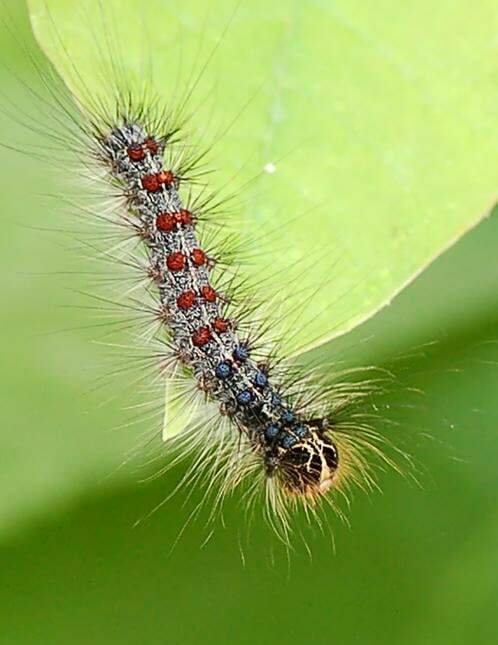 Suppression efforts, to be effective, must be conducted when the gypsy moth larvae are in the second to third instars, usually late April to early May in Maryland. Caterpillars are followed by the brown teardrop-shaped pupa, secured by sparse strands of silk in protected resting areas under bark edges or tree limbs. The adult moth emerges in about a week. Males are light brown day-flying moths with feathery antennae that live for about a week. In contrast, the female moths have white wings with small black markings and light brown bodies and are much larger. The female does not fly, but remains near her pupal resting area. Adult gypsy moths do not feed. Mating typically takes place within two days after emergence and eggs are laid the same day, after which the female dies. Eggs are laid in a rounded oval 1”x 2” mass of 1000 or more eggs. The female covers the mass with the light brown-tan hairs and scales from her body. The eggs are laid in the characteristic resting sites – the undersides of tree limbs, rocks, and objects on the ground, behind bark flaps or signs, inside crevices, and similar places on homes or any manmade object. In Maryland, the egg stage lasts from July until April or early May when a new generation of caterpillars hatch. The gypsy moth has five traits that result in significant social and economic impacts in its new environment. First, it is a relatively large insect (with a correspondingly large appetite). Second, because the females are flightless, they disperse poorly. Third, reproductive rate is high. These three characteristics work together to produce large numbers of hungry caterpillars rapidly in an area, with defoliation of their favorite trees, the oaks, the inevitable result. This rapid increase in gypsy moth populations is causing the current outbreak in the Mid-Atlantic. A fourth characteristic, the ability to consume some 400 kinds of plants, enables the caterpillars to continue feeding on other trees after the oaks are all denuded. In times of severe defoliation, entire hillsides or mountains are virtually stripped bare. No native caterpillar species so completely strips such large areas. However it is a fifth characteristic that is the killer – literally. Gypsy moths take about eight weeks to grow from the time they hatch in mid-April. The last instar eats more foliage than all the others combined, resulting in the most leaf damage in early- to mid-June. By that time of the season, tree leaves are fully developed, unlike younger leaves eaten by other spring-feeding caterpillars, which are easily replaced. 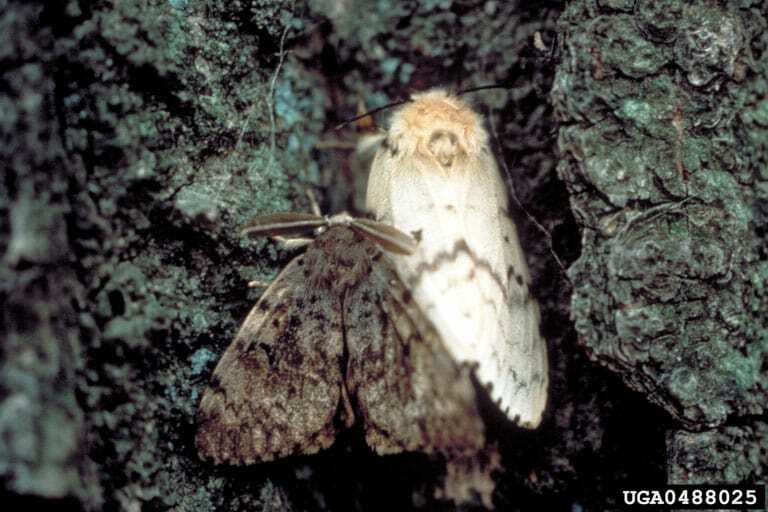 In destroying mature leaves, gypsy moths consume significant amounts of a tree’s nutrients. June is early enough in the season, however, that trees have reaped very little return from their photosynthetic processes. The loss of the majority of their leaves stimulates many trees to refoliate, further depleting their stored nutrients. One or two such defoliation-refoliation cycles leave the trees severely weakened, if in fact they are not killed. Weak trees are more susceptible to diseases and other insects (especially, for oaks, two-lined chestnut borers). These trees often die 1-3 years after the last defoliation. On the more hopeful side, in 1989, a new fungal disease of gypsy moths showed up in the US. This fungus, called Entomophaga maimaiga, probably arrived from Japan, which is near the ancestral home of the gypsy moth species. This disease will effectively depress gypsy moth populations in most years. This disease is density independent but is most effective with cool wet springs. This means that the average amount of damage is reduced, although outbreaks do still occur, like the current one that is plaguing the mid-Atlantic states. In 2015, New Jersey, West Virginia and Pennsylvania suffered the worst defoliation in many years. Consequently each of these states will be mounting large spray programs to protect weakened and threatened forests. These programs will conclude by June 1, 2016, before the period of heaviest caterpillar feeding, with the desired result — much reduced forest damage this year. If the spring of 2016 does not have a fungus outbreak, Maryland will join the other Mid-Atlantic States in experiencing this gypsy moth outbreak. For more information about other Invasive Species of Concern, visit the Maryland Invasive Species Council or call the Maryland Department of Agriculture at 410-841-5920.